Campground is now operated by the town of Millington, TN. As of March 2017, this area is no longer a U.S. Military Recreation Area. WEB page says reservations not needed - wrong! On 10/1/2016 after driving 18 miles out of my way I was given biggest run around of my life. The phone number listed isn't correct and they admitted that their WEB page was out dated, Hum, why not update it then? Was told I needed a reservation, but they could give me one, all I wanted was night because we were passing through. Apparent they had scheduled an activity at the lake for the next day so only the homesteaders were allowed to be there. Do yourself a favor and skip trying to stay here. Maybe when their money dries up they will make a change of heart and be more helpful. Nice, quiet, private area near the lake. Plenty of picnic sites and outdoor recreation opportunities. This campground is old and run down. The office is being renovated, but there's a trailer nearby as a temporary office. As mentioned before, sites are very close together. Sites in area B have more space between them, but there's no sewer in this area. The campground is okay if you want to be here and near the lake. Otherwise, we prefer the nearby Midway RV Park. Prices are a bit high here (and at Midway), especially here with everything old and falling apart. The sites are really small had room for the slides but the awning was over the next parking spot. They have had a rate increase to $18.50 a night for full hookups. Some Passport America sites are cheaper.. I guess it OK for a few night while you tour Memphis, but no place to spend any quality time..
i could not rate this site because i stop by there today 040909 planed to stay the nite talked wife into it also (she is not a camper) but after driving around the ???? park i found NO SHOWERS RESTROOMS (i must have not looked at the correct place but not much chance of that small nice looking place if you have a BIG MOTOR HOME OR 5TH WHEEL camp host no were to be found; we do not have a self contained unit its a raised roof van with all that i need except the bathroom and showers and i made the mistake when i found this R V PARK and thought they would have them. Even with detailed directions, it can be a little hard to find. But it was a decent place to stay. I tent camped with no complaints and had the place to myself. 3 lakes to fish. Showers were old but reasonably clean. Laundry facilities are in the same building as the showers. Easy in/out for RV's with numerous "overflow" sites near the water. Very quiet. Just bring bug spray. 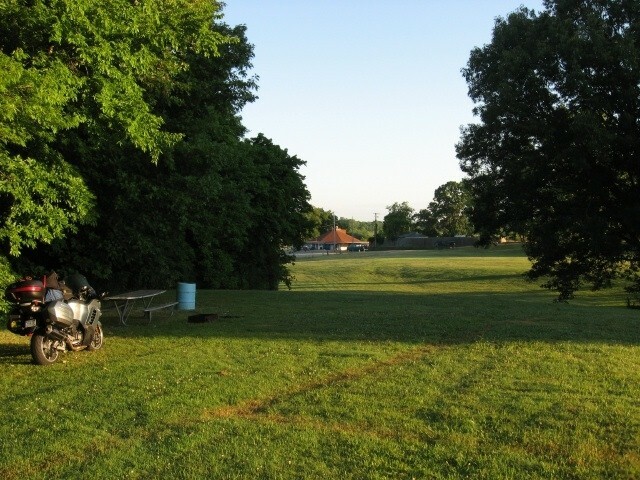 Navy Lake Recreational Area and Midway RV Park are both managed by the Central Reservation Center, Mid-South Naval Support Activity, Millington, TN. However, the parks are as different as day is to night. The Navy Lake facility is old and in much of need of support and motivation from the Command level of the base. The buildings need too much repair to even consider painting or providing a Band-Aid fix. The gravel RV sites provide water and electric service only. The 10 full service sites (water, sewer and 30 amp power) are paved providing a level parking area. They are so close together that awnings and slide-outs become a major challenge. On the plus side of the Navy Lake facility are the surroundings, which include a small lake, with well manicured lawns on rolling hills, in a wooded area (no shade for the sites). Lovely on the lake, with lots for kids to do/explore. Although very old, it's being maintained much better than many old military CGs I've been to. Not many sites out here, and, being not behind gates, there was a shooting among "locals" at one of the pavillions! The host told me to keep watch of my kids on weekend nights. No recycling here, on base though at the end of Wasp Rd and to the right (you'll see it). There are laundry and showers at the top part of the CG. Lower CG has only water/electric and is by the lake house, and can recieve WiFi reception; on the hill=no reception. Minimal organic at the Commissary; 30 mins into Memphis though to Wild Oats. The other CG (called Mid-Way) in on base a mile or two behind the commissary; has nicer sites, you get phone card computer connections, but there is still no shower/laundry facility. The building is in place, but it's not close (right now) to being completed. There is a back gate with easy access for big rigs, but I couldn't tell you how to get in. Hopefully, the new (whenever that is) Military Camping book will have better directions and more accurate phone numbers for both these places. Was there in early Nov 2006. See nothing has changed. Agreed with other raters. Think it is far over priced for what you get. Would not drive out of my way for 1 or 2 days to stay there unless needed lots of other things on the base. Too bad the one on the main base is all new and could really be nice with the right management, but have no change to these in the last 2 years. We were confused reading about Mid-South or Navy Memphis or whatever it's called. There are 2 RV parks here at Navy Memphis. The "Midway" RV park that is ON BASE (behind the gates) has NO facilities. No bathrooms no showers. There was 1 Motorhome marked "host" but no one was home. There were 15 identical Keystone Hornet TT's with no tags set out thru' out the park, but no one was using them ?? It's right behind the base commissary. To get to "Midway" there are barricades to weave thru' at both gates and I don't think I could make it thru' either one. I couldn't get a cop to tell me how to get on base to that RV park without having to make the barricades. We inspected this "Midway" RV park w/out our TT, after we settled into a spot at the "other" RV park. It's called Navy Lake. It's across the street and about 3 miles from the main base. No gates on barricades to get into this one. It's on a pretty little lake, but is very sparse. The 8 paved (back-in only)sites with W/E & sewer hook-up were really just parking lot spots. We opted for a gravel site 100 yds down the road. The bath-house nearest the gravel pads has some old, old bathrooms & no showers. The showers are down the road near the paved sites. I resisted making jokes about "Navy" showers until our neighbor who was USN retired made them himself. I have never seen a shower that narrow. He told me they were smaller than on board a Navy ship. I knew they were small since my shoulders touched the walls. They worked; had good hot water, but were poor in cleanliness and maintenance. Main base Navy PX & commissary are first class. No library. For internet hookup take your own Wi-Fi 'puter to the Rec Center (Single Sailors Center)on the opposite side of the base Gym. Or use their computers to check email, like we did. Very friendly. Pharmacy is in the PX mall. They weren't allowed to re-fill my civilian prescription but gave me an emerg 30 day supply- gratis!! Great folks.They can re-fill military 'scripts. Golf course was very nice. Brand new HUGE clubhouse under construction. The drive into Beal Street (Memphis) takes about 45 minutes, but we loved Navy Lake's quiet, secluded location and didn't mind the drive into the Big city. This could be a nice campground. It is surrounded by a pretty lake and is in a rural setting. But the campsites, both full hookup and water/electric are not very attractive. And the guys running the campground - where did the Navy get these people? I don't think I would ever go back there again.